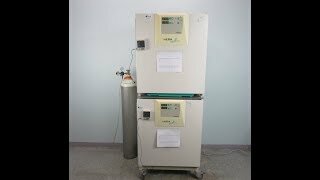 The Thermo Scientific HERACell 240 CO2 Incubator with copper interior offers you the best in cell and tissue incubation. This CO2 incubator has a built in 90°C decontamination routine to eliminate effectively all contaminating organisms for a sterile environment. This decontamination cycles efficacy is bolstered by effecting all sensors, shelves, fan and even the water reservoir, with 50% less surface area than most incubators, so no parts need to be removed for separate decon. The copper interior of this lab incubator while providing excellent connectivity also provides a surface that’s naturally fungicidal and bactericidal for added protection. The door gaskets of this tissue cell incubator are easily removed, with smooth surfaces for easy cleaning. The Thermo Scientific HERACell 240 CO2 Incubator with copper interior has an innovative humidity system that protects your samples from drying out, replacing the traditional water pan with a deeper water reservoir and sensors to warn if levels get to low. Recovery happens 5 times faster in this CO2 incubator thanks to the larger surface area of the water, and a patented floor heating system. The Thermo Scientific HERACell 240 incubator is lightweight and comes stacked to maximize lab workspace, with doors that can be set up for either left or right handed use. These Thermo Scientific HERACell 240 CO2 Incubators come stacked together for maximum use of space. Both have been tested and are performing to expectations. Please note there are cosmetic blemishes (pictured) however they do not impact performance. All of our lab equipment comes backed with our standard warranty. Should you have any questions, please don't hesitate to contact us.